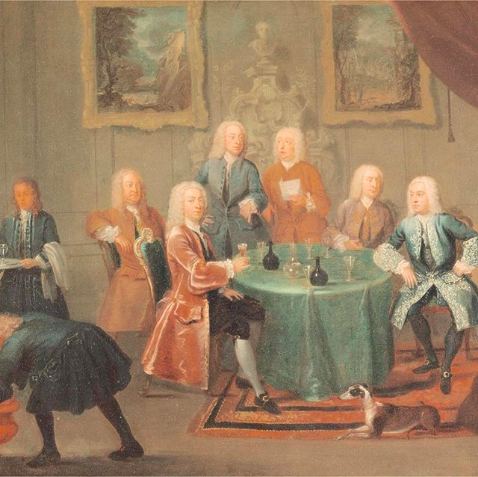 “The Brothers Clarke with Other Gentlemen Taking Wine” is a 1730-35 group portrait by the Scottish painter Gawen Hamilton (1698–1737). We are witnessing a wine tasting held nearly 290 years ago. The Clarke brothers (who they?) and other bewigged gentlemen sit or stand around a covered table on which there are dark glass bottles, a glass carafe, and elegantly tapered wine glasses. On the left, a servant can be seen filling a decanter from a large wine cooler on the floor, while a miserable-looking servant boy next to him holds a tray of glasses, watching and waiting for the bottle to be filled. A dog lies contentedly in the foreground. All of the glasses are empty except for that of the seated gentleman who looks out at the viewer. One of the men is pointing to his empty glass and speaking to the man on his right, perhaps discussing the wine just sampled.